Jewelry, Watches & Coins can be preview by appointment only. Call 877-968-8880 to schedule your preview appointment. This auction begins with 100 lots of rare coins and currency, including a 1858 Flying Eagle cent PCGS MS 64, two 1909 S VDB Lincoln cents, an 1832 50 cent PCGS MS 62, an 1798 bust silver dollar and 13 states. Many Morgan dollars including many Carson City silver dollars. There are approximately 20 lots of gold and platinum coins, mostly certified and a host of other rare coins. 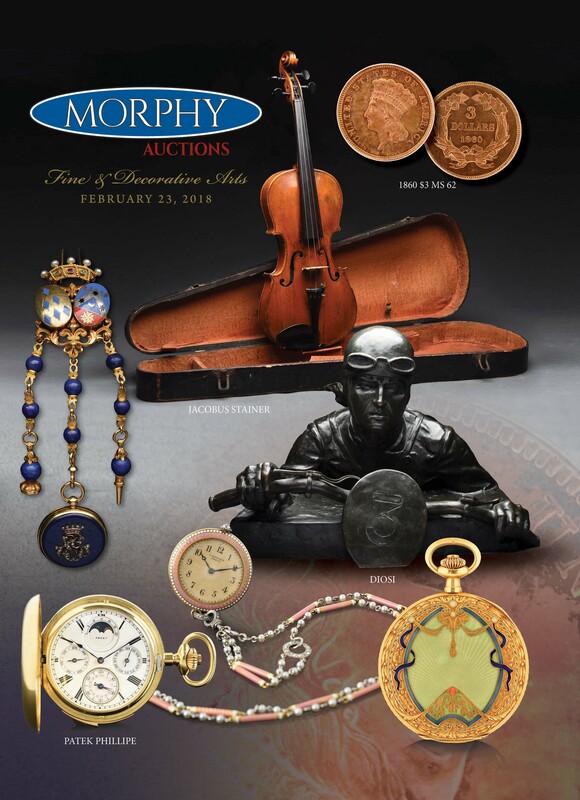 The coins are followed by 200 lots of jewelry and rare gold watches by Tiffany, Patek Philippe, Rolex and others. An 18K gold and enamel Cartier ladies pendant watch and chain & a Patek Philippe 18K triple date moon phase repeater and other repeaters. Next are a grouping of match safes followed by over 70 silver card cases, mostly English circa 1870’s and approximately 75 English and French chatelaines. Many gold and precious stones including an unusual set of bats. A large collection of Lorgnettes and opera glass, approximately 75 total. Many are gold and unusual. Then approximately 50 lots of fine sterling silver with Gorham, and others with many serving pieces and tea infusers and strainers. A rare English sterling silver Rolls Royce desk clock with Cartier clocks and others. Many Arts and Crafts pieces plus approximately 100 lots of oil paintings, many of historical significance, including an Abner Zook three-dimensional Amish farm scene. A nice selection of bronzes, many are motorcycle and racing themes. Art glass perfume bottles by Steuben and Tiffany and numerous netsukes. An interesting grouping of political buttons are represented including a rare President McKinley inauguration ribbon and medal. A vintage Santa Clause post card album of over 200 cards. A nice grouping of rare violins and bows followed by a large selection of pottery, including Wells, Amphora, Roseville, and others. This is a magnificent auction filled with many fine antiques and rarities.